Monin syrups have excellent taste and delicious aroma. Adding them to lemonade, coffee or milkshake you can easily turn an ordinary drink into a gourmet dream. And regardless of whether it has alcohol or not, your mood will instantly improve. - slices of orange and Apple peel for decoration. Allow water to cool in the fridge or the freezer. Mix the syrups, dilute ice-cold soda, and mix thoroughly but not too vigorously to keep the bubbles. Garnish with a thin half-circles of orange and curls from the peel of the Apple. The cocktail syrups Monin "Peach Melba"
Fill with ice large glass or a glass half height. Combine in a shaker three types of syrup, fruit juice, milk and cream. Vigorously shake it several times and pour the contents into the prepared portioned dishes. Insert a straw pinned to her slices of peach. - ground cinnamon, grated chocolate or cocoa powder. Prepare strong coffee and dissolve in it syrup. Heat the milk, bringing it almost to a boil. Cool completely both liquids. Put ice cubes in a wine glass or Irish-glasses (with handle), cover with milk and gently enter the coffee. Place on the surface of the cocktail with whipped cream, sprinkle ground cinnamon, grated chocolate or cocoa powder. Serve drinks with long narrow spoons. Alcoholic cocktail with Monin syrups "Last call"
Rinse cranberries, mash it in a blender, put in a three-layer piece of cheesecloth and press the juice. Pour it with vodka and two syrups into a shaker and shake for 5-10 seconds and pour into triangular wine glasses for Martini. Put in a cocktail a cherry. Squeeze the juice of a lime, pour in a glass with rum and syrup. Top up the cocktail with soda, lightly stir, put ice and Basil leaves. Highly concentrated Monin syrups is a great invention of the eponymous French company, whose motto is "Passion for quality" says a lot. They quickly won the hearts of gourmets thanks to the unmatched flavor characteristics of the product. Just a couple of drops of syrup, and the drink turns into a masterpiece. The company "Monin", leading its activities since the beginning of the 20th century is unattainable leader in the manufacture of thick syrups. The secret of its success is simple – the company uses only the highest quality products that pass strict verification in specially equipped laboratories, and no preservatives. 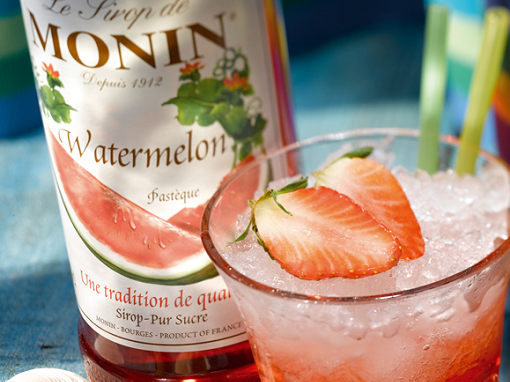 The collection of flavors Monin syrups is constantly updated. Today it includes more than hundred items. Monin Premium syrups with the highest concentration. Monin Keddy – a cheaper version of the same flavors, but not with such a high amount. Rather, additional flavors, coffee, cakes, chocolate or ice cream. Recently, the company produces Monin SugarFree with sugar replaced by fructose, which without harm for health can enjoy diabetics and adherents of diets. 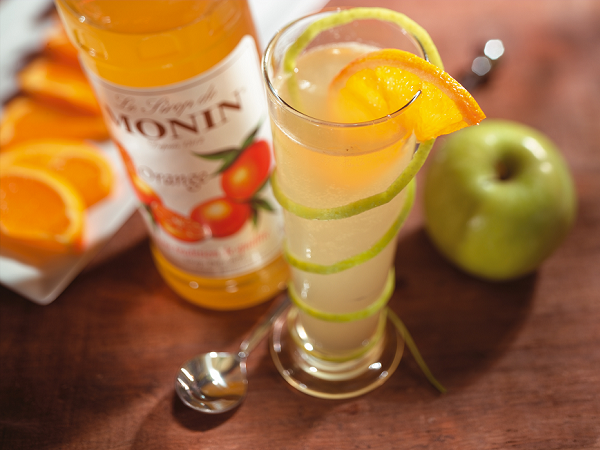 Fruity and floral 'library' of flavors Monin make up a large part of the product range. They are quite familiar options like Apple, orange, apricot, strawberry, plum, lavender, raspberry, watermelon, melon, banana, black currant, and even the elder, and exotic lemongrass, guava, kiwi, Sicilian orange blossom, rose. In the collection of "Monin" also presents a line nut (almond, macadamia, hazelnut, pistachio, etc. ), confectionery (chocolate, honey, praline, tiramisu, buble-gum, creme brulee, caramel sweet and salty, etc. ), spices (Basil, cardamom, ginger, anise, cinnamon, tarragon, etc.) and, of course, alcohol (Mojito, Amaretto, blue Curacao, gin, tequila, whisky, Caipirinha, etc.). Syrups are consumed quite economically, which compensates for their relatively high price. The most common application of the Monin syrups are cocktails and soft drinks. In order to obtain a glass of the finest beverage, you do not need to be a bartender, it is only necessary to have in the kitchen a bottle labelled "Monin". 10-30 ml of its contents was diluted freshly squeezed juice, energy drink, milk, tea or alcohol. Here is one of the most popular recipes – mix strawberry 10 ml and 30 ml watermelon syrup 30 ml vodka and 60ml of cranberry juice. To make lemonade mix in the right amount of simple or carbonated water 7-8 times a smaller amount of syrup. Magic becomes coffee or tea, if you pour in a Cup a few drops of Monin. However, it should be borne in mind that not every taste will fit in this case, other syrups may just curl up in contact with boiling water, milk or cream. That is why the company defined a special branch for coffee or tea connoisseurs, which includes most flavors of nut, confectionery lines and tastes of alcohol and spices. When you create a drink you should consider some points: for espresso should not exceed 5 ml syrup, latte or cappuccino – 20-30 ml, and coffee cocktail – 30 ml. in addition, we must remember that the syrups to fructose have a more pronounced sweetness, and therefore should be used at a lower dosage.